I just got done building my first circuit diagram using Eagle CAD. This is version 2 of the Artemis flight computer, which I intend to turn into drilling files for my CNC Mill. 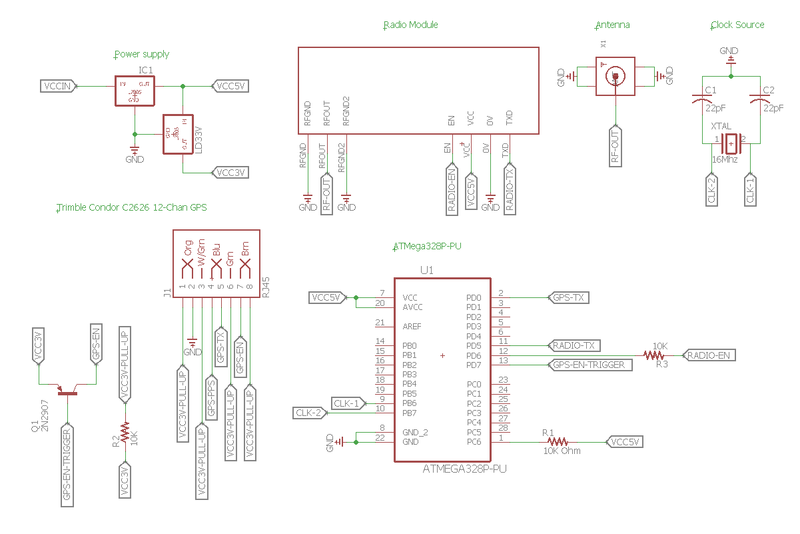 This circuit diagram is essentially the exact same circuit that I used for Volatus-1, except that it is not an Arduino sheild, but instead, a self contained Atmega328p based circuit. I decided that the Volatus name would be used for the line of shield or prototype computers, and the Artemis name will be used for self contained PCB’s as was the case with Artemis-1. So this is Artemis-2 based on Volatus-1 and compatible so it’ll use the same firmware. Note-1: The Trimble Lassen-IQ line of GPS modules is now obsolete, and so this circuit uses the Trimble Condor C2626 module which is recommended by Trimble as a replacement for the Lassen-IQ. The Trimble recommendation also states that the C2626 uses identical pin-outs to the Lassen-IQ, and so despite the fact that the datasheet for C2626 does not mention a pull-up resistor for the unused pins, I went ahead and included them from the Lassen-IQ based circuit. Note-2: The Trimble GPS module comes in a mechanical package that may be soldered onto a PCB, however, the only connector I could find for this purpose used surface-mount pins. Given that there are eight pins with 1.27mm pitch, I did not feel confident to solder this onto a PCB, and so I installed an RJ45 socket in it’s place. I have an 8-pin connector crimped onto a ribbon cable supplied by Trimble for connecting to the GPS module, so I intend to solder an RJ45 jack onto this ribbon cable (or rather, crimp the jack onto a network patch cable and solder this to the ribbon cable). Note-3: The second IC in the power circuit is using the same component as the first, when in fact, it is a compatible 3.3v regulator. I could not find a suitable symbol for this IC in the Eagle libraries, however, it’s a compatible foot-print.